Rachel used our Arbosana extra virgin olive oil to prepare the dish, saying its nutty flavor paired well with the farro. 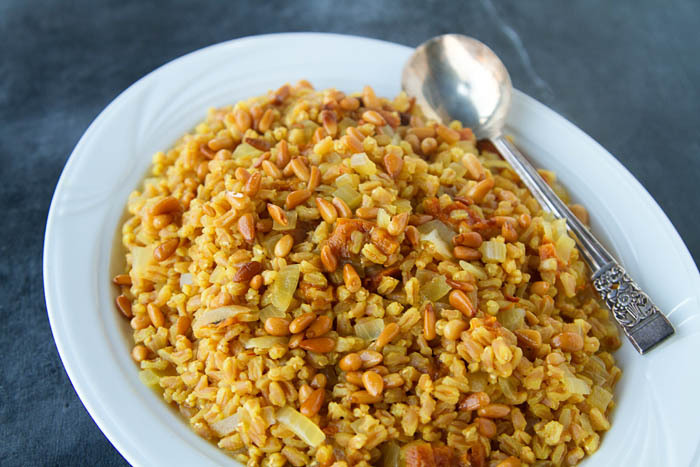 A touch of saffron, meanwhile, infuses the farro with a lovely yellow color and a distinct aroma. To make the dish, toast the pine nuts briefly in olive oil until golden brown. Remove from the saucepan. Add chopped onion until it softens and just starts to brown. Add the farro and cook a couple of minutes, stirring frequently. Stir in the apricots, water, salt, and saffron, then turn the heat up to high, and bring it to a rolling boil. Give the farro a stir and then place the lid on the saucepan, reduce the heat to medium-low and simmer for 30 minutes. Turn the heat off and let the farro sit (covered) for 5 minutes and then gently fluff with a fork.